Yesterday we decided to get out and about a bit in the morning for some fresh air and exercise. We had lots to do at home in the afternoon so we didn’t want to stray too far from home so we headed to a local farm about a 10 minute drive away – Amelia Trust Farm. The children had a lovely time playing in the play area, looking at the animals and running around in the fresh air. Little Boy loves slides so was really happy to spend lots of time going up and down the slide! Bean is so good with him now, they are like little buddies and they played on the slide together, her helping him up and him giving her the run around! Little Miss J is going through a doll phase so spent ages swinging her doll in the swing! We went for a little walk to see the animals. Little Boy wasn’t talking nearly so well last time we visited the farm so it was really nice to hear him calling out the different animals names and he was really fascinated to look at them up close! The donkeys even made real ey-ore noises which was fabulous and he was delighted! We then went for a longer walk around the back of the farm on their fairy and gnome trail. The girls loved looking for the different numbered fairies and gnomes and Little Boy tried to join in with the counting too. There was another adventure playground further along the walk and so we stopped there for them to have a nice little play too. We were having such a nice time that we didn’t notice how long we spent there until the children started to get hungry. We tried to buy lunch in the cafe but sadly their card machine wasn’t working. It was ok though as luckily I had brought a bag of snacks with me (I usually do, just in case). Hungry children are never pleasant so it pays to have snacks always available. Earlier in the month we had been sent a great hamper from Aldi with a selection of the fabulous range they do for young children. Luckily I’d had the foresight to put some into my bag before we’d headed out. The children feasted on their rice cakes. They all like sharing them and these ones from Aldi are great because they are excellent value and taste nice. They aren’t too heavy to carry around either which is important. I also had a couple of the Mamia fruit pouches in my bag which they devoured very quickly too! The Mamia Juice came in very handy too to refill the drinks cup we had brought with us for Little Boy. I love that it is all organic too. And what mum’s handbag is without a packet of wipes? These were perfect for cleaning the mucky hands and faces before and after their snack! I love the Aldi Mamia range, and we buy things from it regularly. The products have such a great quality and taste but they are significantly cheaper than their rival counterparts. I like to save money where I can and I often shop in Aldi as it is much cheaper than other supermarkets. We always have a little stash of snacks like rice cakes and fruit pouches for when I need a snack in a hurry and I can just throw these into my bag and off we go! And as you can see by the cafe being closed, snacks like this will always come in handy when my hungry three are around! Gorgeous photos and what a cute day out! My son would love the fairy/gnome trail!!! Lovely pictures. Aldi seem to do a good range don’t they? When my son was small you had to buy the premium priced ranges to get those sort of snacks, so good you can get them on a budget now. I have heard good things about the Aldi range, I haven’t tried them yet, I must try them. 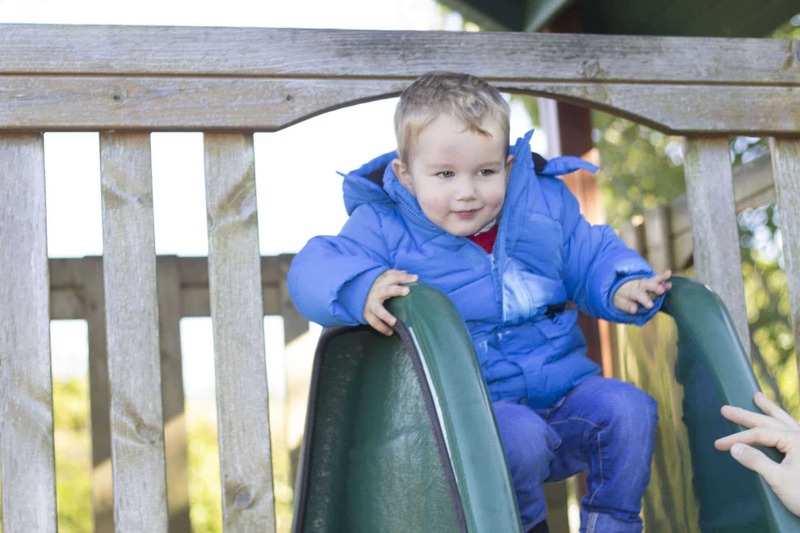 We recently went to Amelia Farm too, it’s a lovely place to take little ones.